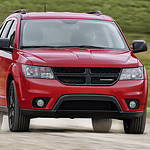 The appeal of the 2018 Dodge Journey starts with the engine that gets it going. There are two choices depending on your needs. The first is a 3.6L Pentastar V6 engine. The other is a 2.4 16 valve 4-cylinder that is a bit more economical. Either way, you can't go wrong. If your vehicle choice is powered by the 3.6L Pentastar engine, then you'll have the added benefit of a 2500 lb towing capacity. The 2019 Journey makes it possible to tow things like boats and trailers in a manner that is easy, routine, and just in time for that vacation you've been planning.